Whether you receive care or visit a loved one at a UNM Health System facility, make your experience go as smoothly as possible by learning how to get ready and take advantage of all our services. Learn about your stay and hospital amenities and services, including spiritual care, high-quality cafeteria and dining options, and gift shops with items that can make your visit more enjoyable. Find out how knowing your patient rights and responsibilities can help you get the most out of a medical appointment. If you or your new providers need a copy of your health history, request medical records. Then, learn how we protect your privacy, Privacy Practices are available on the HSC Privacy Office (also available in Spanish and Vietnamese). Review billing and insurance information to plan financially for medical care, and see whether you qualify for financial aid, care assistance or a self-pay discount. Request an interpreter if your first language isn't English, and explore our commitment to Native American patients. View our visitor guide to learn how to protect patient safety while you support a loved one in the hospital. If you're from outside Albuquerque and need a short-term or long-term place to stay in town while visiting a patient, ask about Casa Esperanza or the Ronald McDonald House. For individual clinic locations and contact information, explore the type of patient care you or your loved ones need. A CarePages Website is free and easy to create. Through it, you can post information and receive emotional support from loved ones and friends during a health challenge. If you have questions about the care you received at UNM Hospitals, contact our Patient Advocate Coordinator at 505-272-2121 or email Cara Garcia. Or, ask your nurse for directions to the Patient Advocate Coordinator's office, open Monday to Friday from 8 a.m. to 5 p.m. on UNM Hospital’s first floor. After hours, ask hospital staff to call the administrative supervisor. If you have questions about care you received at UNM Sandoval Regional Medical Center, call the medical center at 505-994-7400. 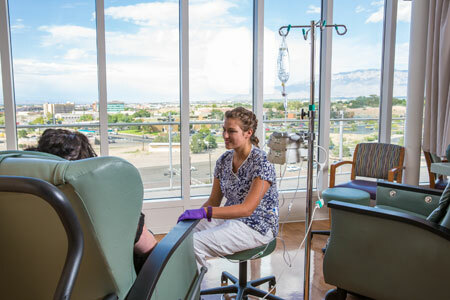 If you get care at the UNM Comprehensive Cancer Center, view patient services information about billing, financial assistance, interpreter services and more.